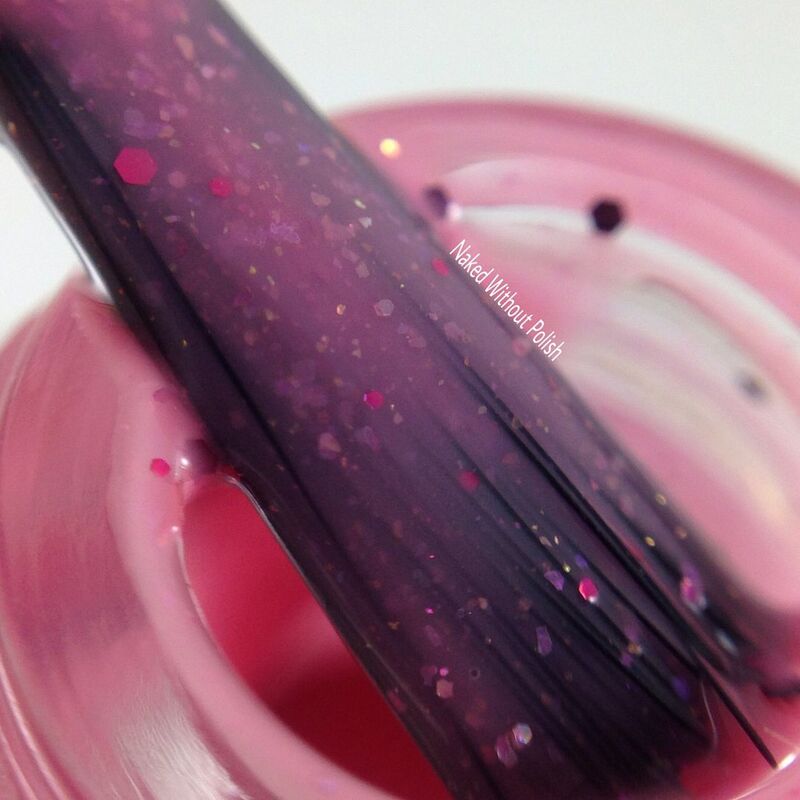 Sugar Plum Sweetheart is described as "a dusty rose pink crelly featuring holo, matte, and metallic glitter in various shapes, sizes, and shades of pink, as well as a sprinkling of rose gold/pink micro flakes". 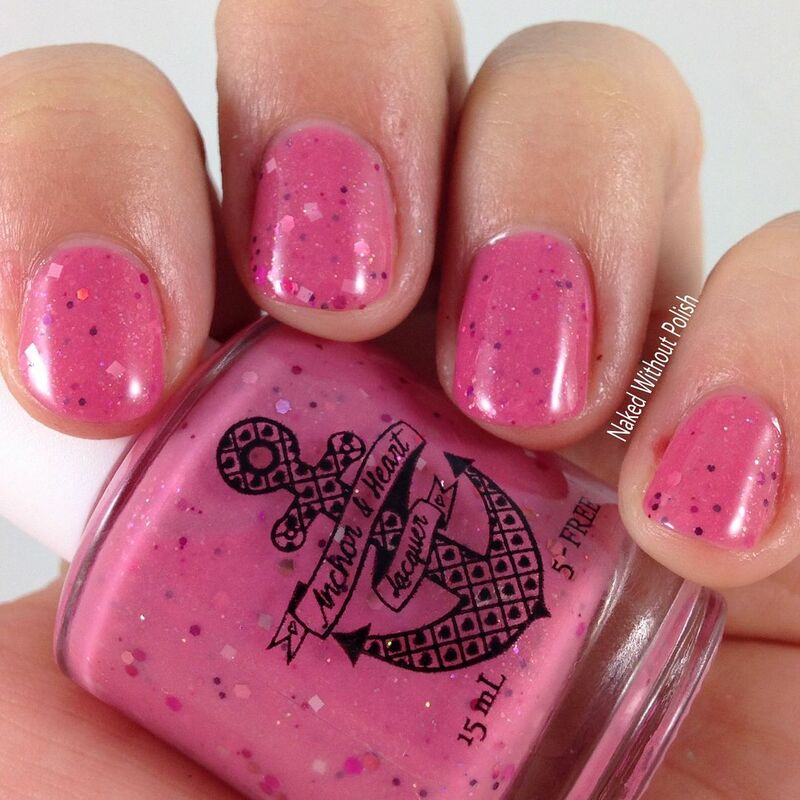 Shown is two coats of Sugar Plum Sweetheart with top coat. 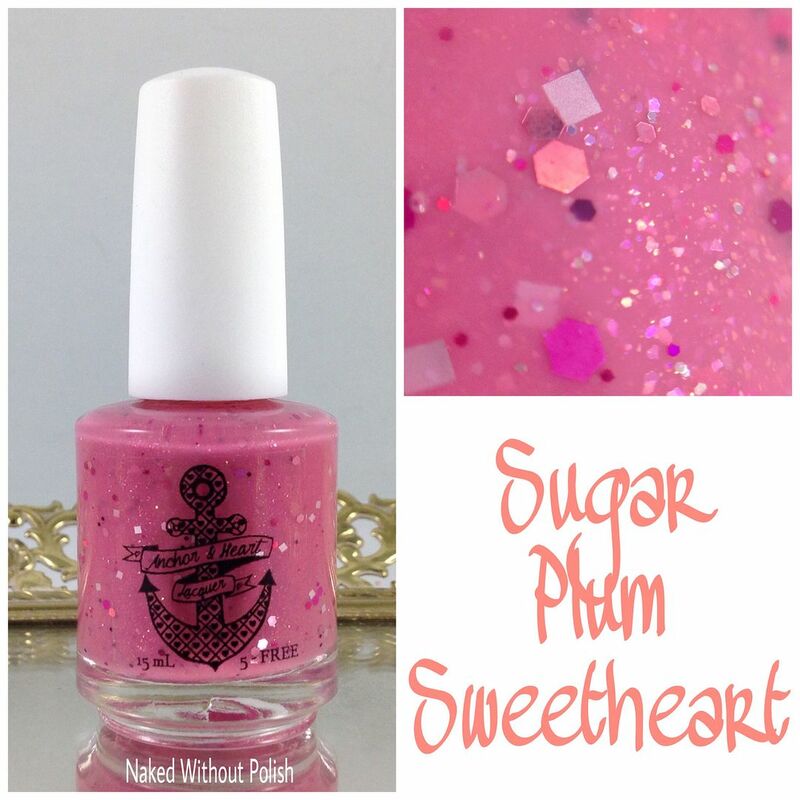 Sugar Plum Sweetheart is a beautiful shade of pink. It will have you dreaming of spring for sure. 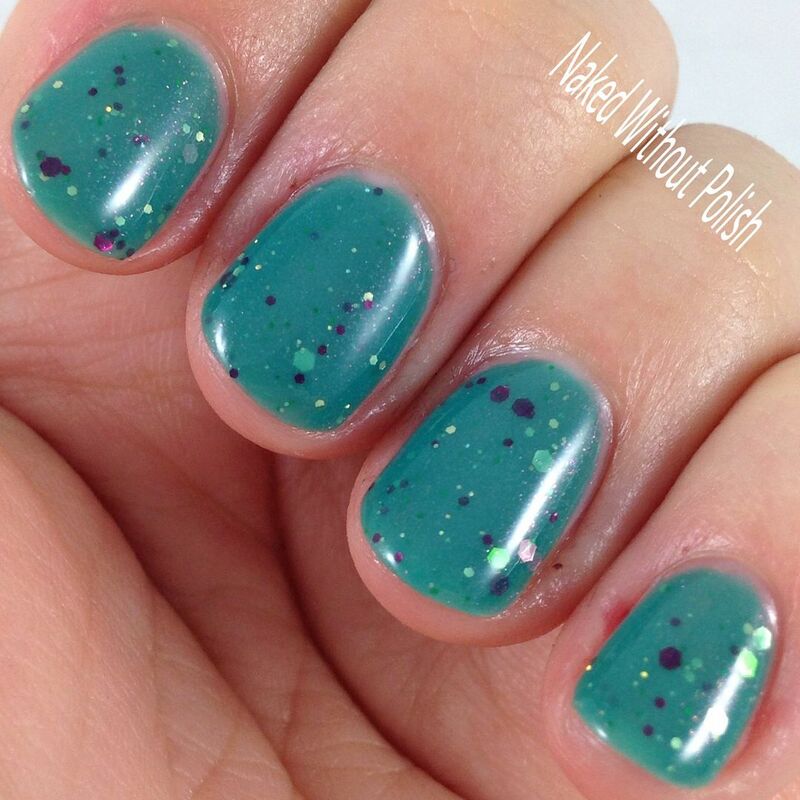 Smooth application and formula, and you always get just the right amount of glitter onto the nail. It was fully opaque in two coats. This would make a beautiful base for some simple stamping. 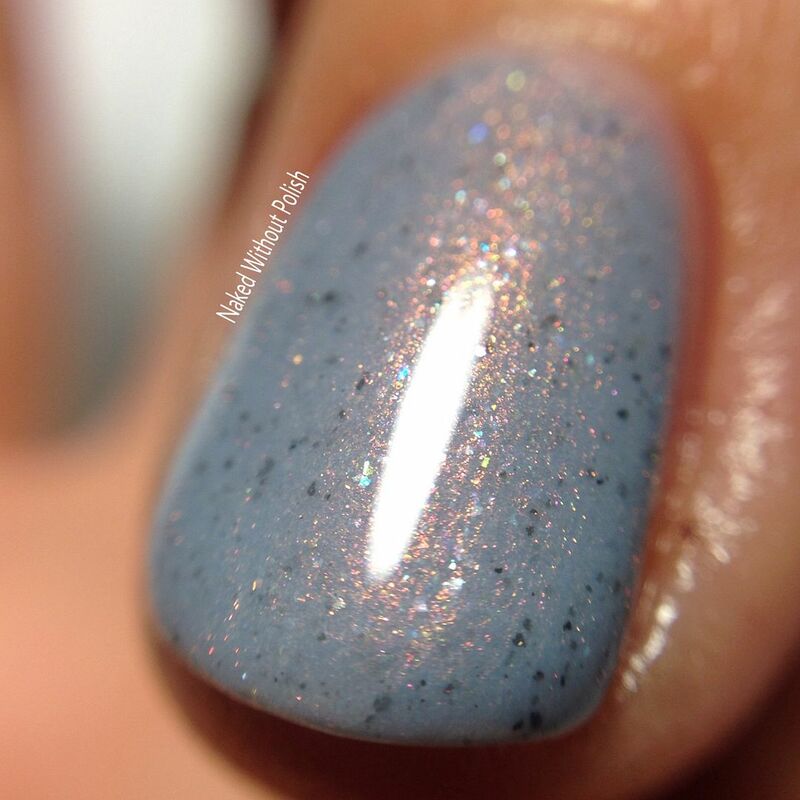 Winter's Shimmer is described as "a pale blue polish that will lean grey or lavender depending on the lighting, with a strong copper shimmer, tiny gray micro flakes, and a scattering of glass flekcks that flash bright blue in the right light". 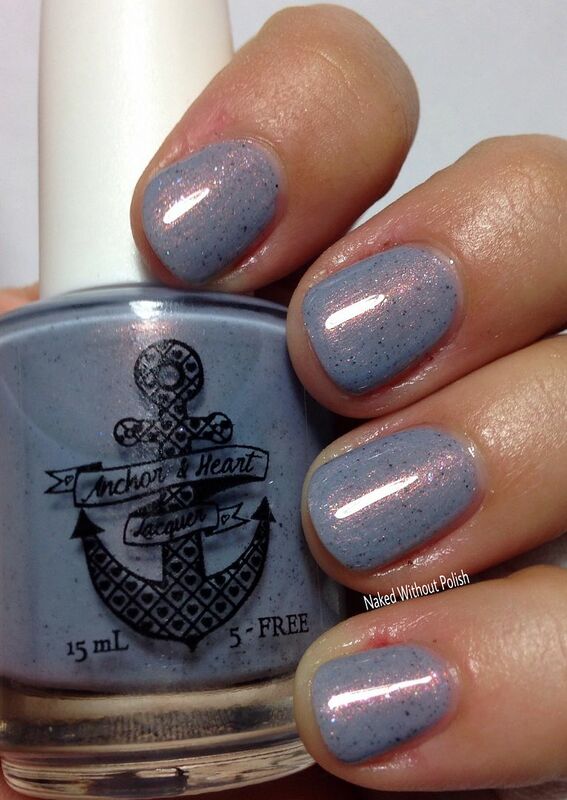 Shown is three coats of Winter's Shimmer with top coat. 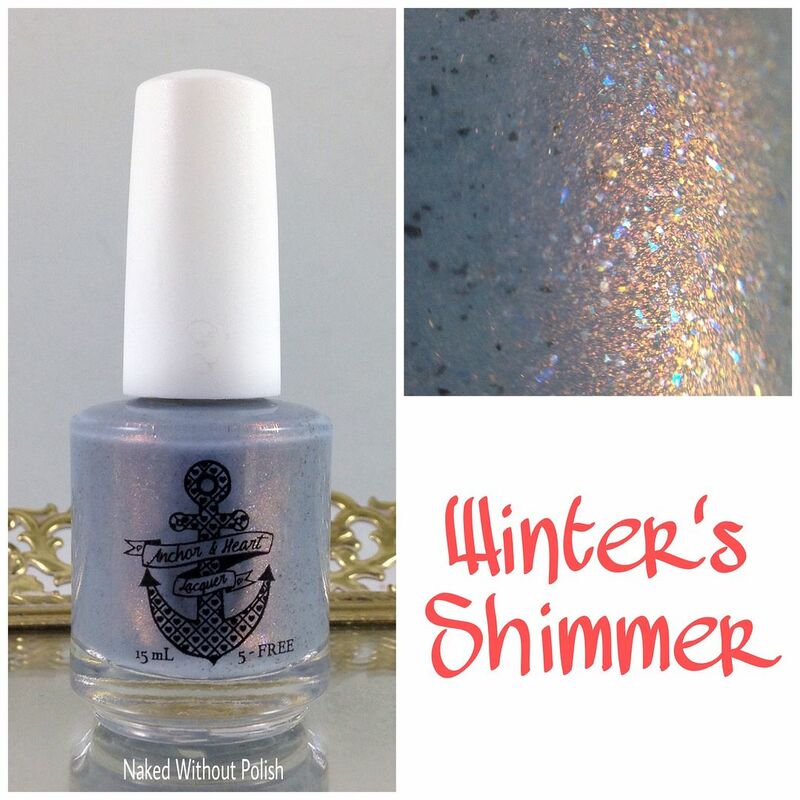 Winter's Shimmer is going to knock your socks off! This combination of colors is unique and quite stunning. It took me three thin coats to reach full opacity. Be warned. You'll be playing with that shift, try not to get distracted while driving! 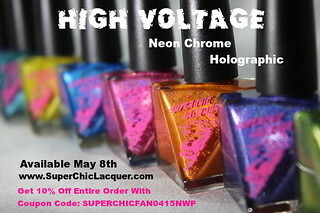 Everyone needs this polish. No ifs, ands, or buts about it! 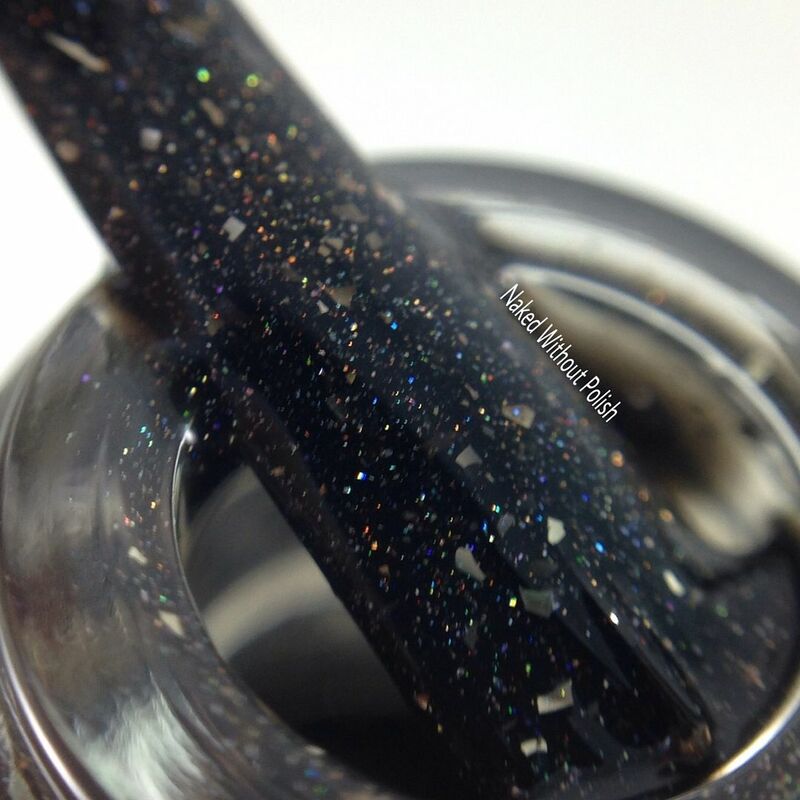 All That Glitters is Coal is described as "a black linear holo with silver flakes, silver holo flakes, and a touch of silver micro glitter". 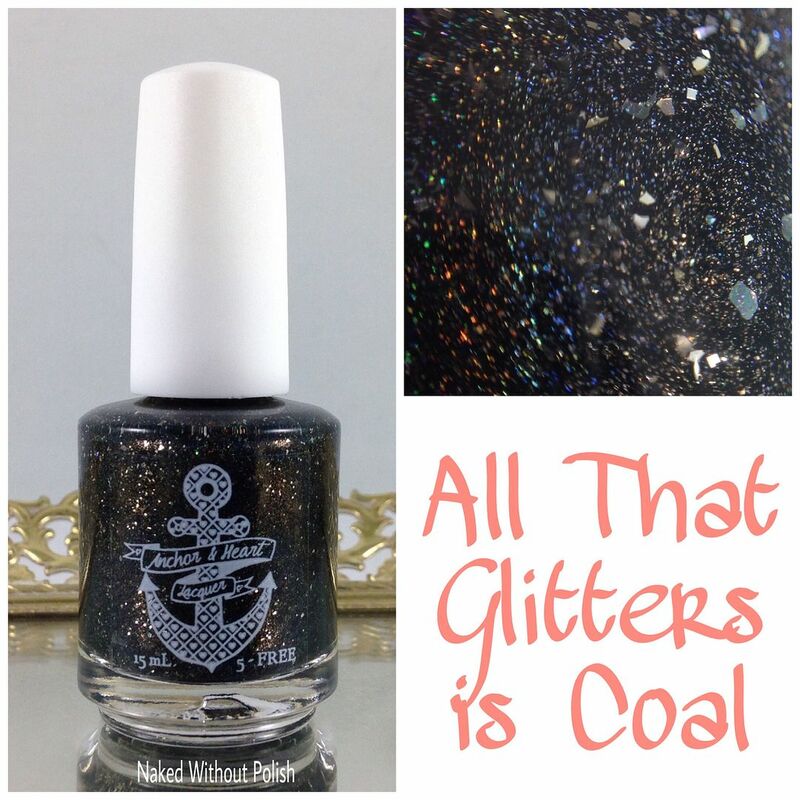 Shown is two coats of All That Glitters is Coal with top coat. 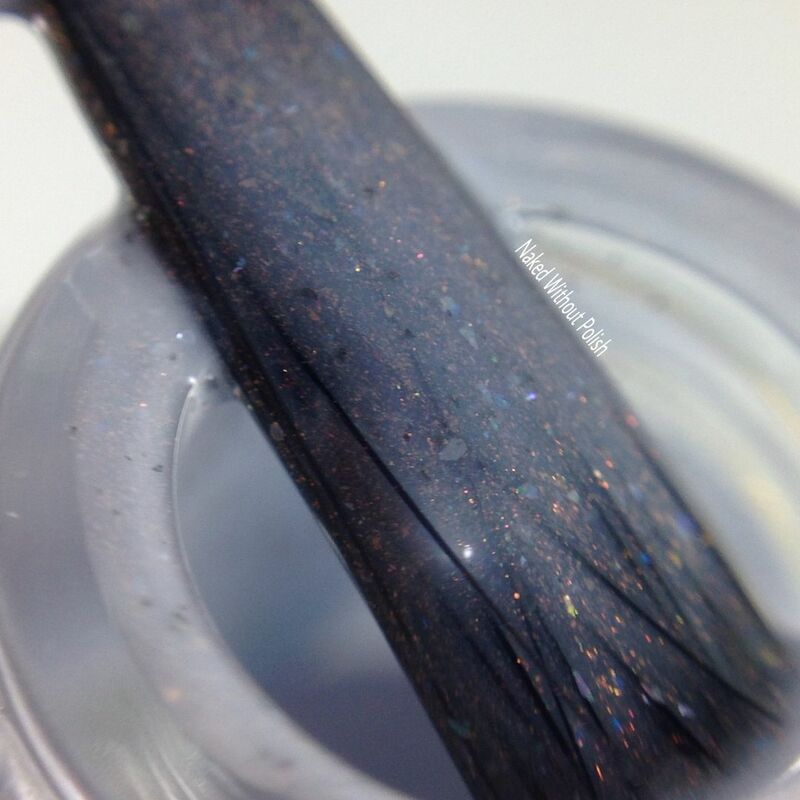 All That Glitters is Coal is a luxurious black filled with that beautiful rainbow from the holo pigment. 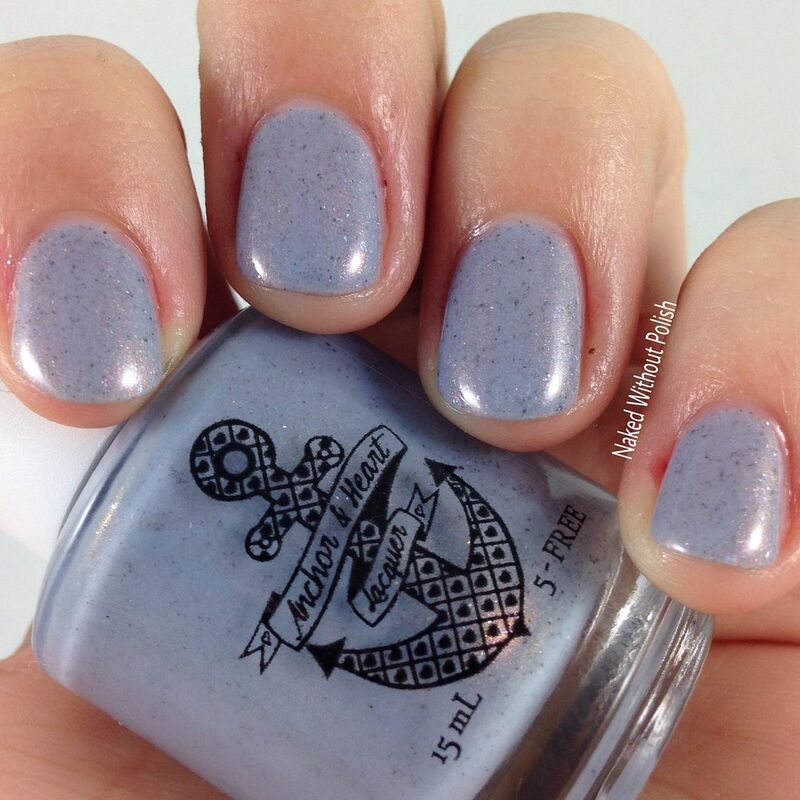 The silver flakes and glitter add just the right amount of something extra without going overboard. I did two thin coats, but you might be able to get away with one coat if you wanted to attempt it. I like the dry time of thinner coats, so I personally wouldn't recommend it. 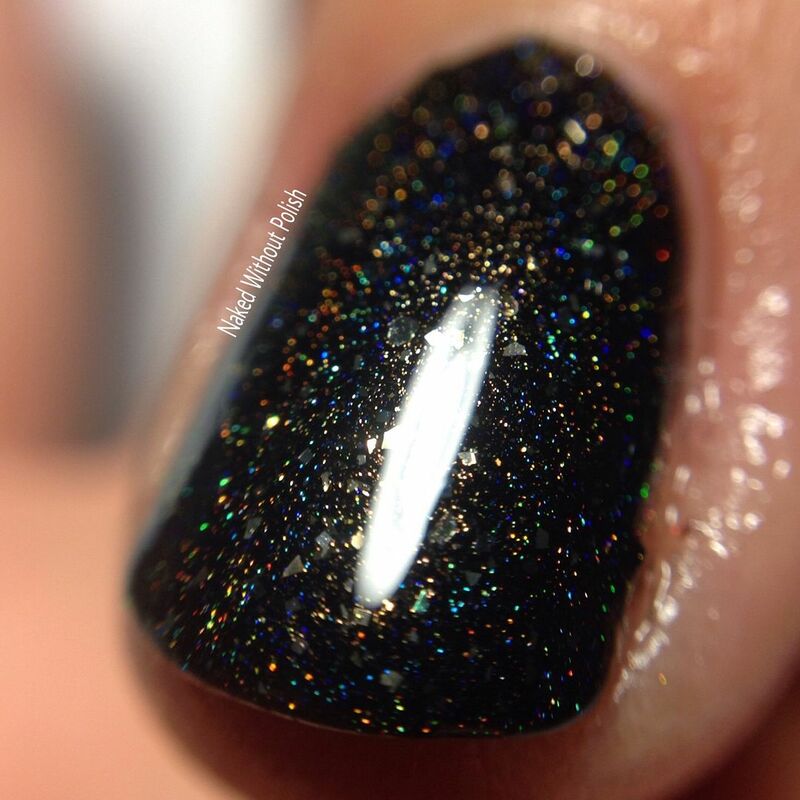 This would make a fantastic base for a New Years mani! 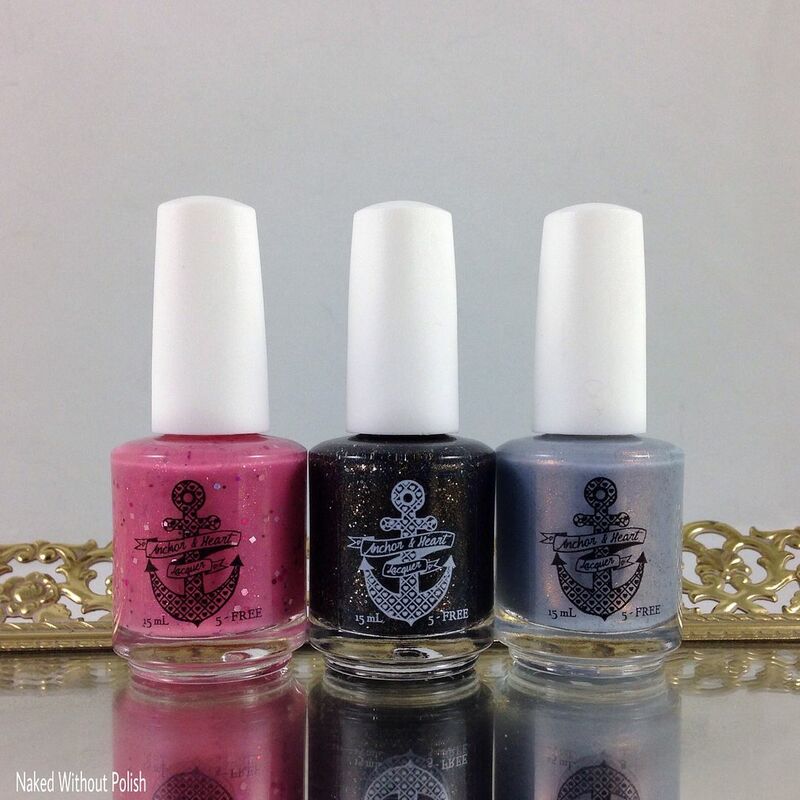 The December 2016 Trio is available now at www.etsy.com/shop/AnchorHeartLacquer. 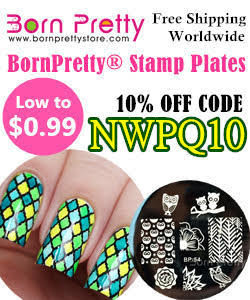 It can be purchased for $28 as a whole or individually for $10 each. The December 2016 Trio will only be available through January 7th, 2017. You won't want to miss out on these. They are really something special. I love how different they are for this time of year. 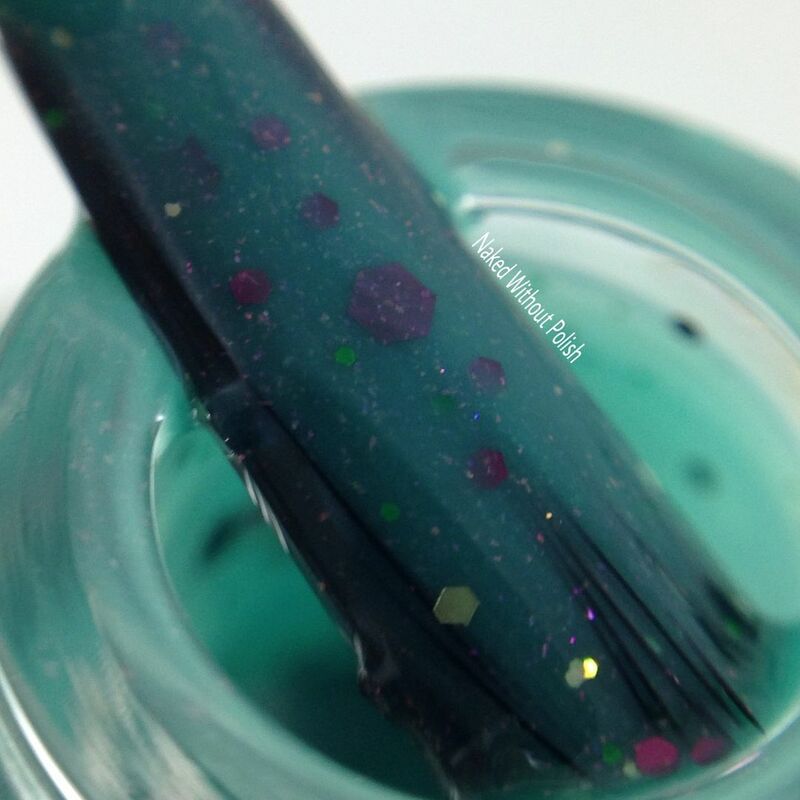 Taryn always puts so much love and care into her polishes and you can see it in each bottle. Expect big things from this brand in the coming year! 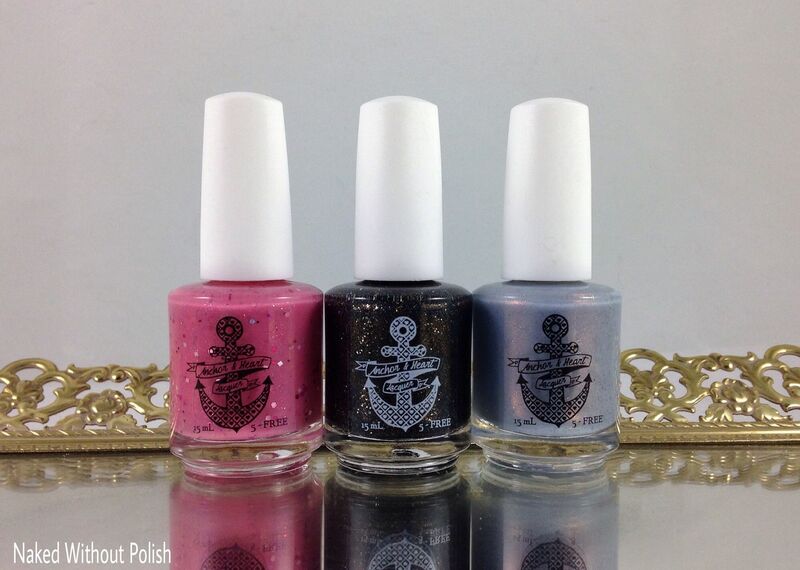 Make sure you are following Anchor & Heart Lacquer on all of her social media platforms (links below) to stay updated on news, releases, restocks, and sales. 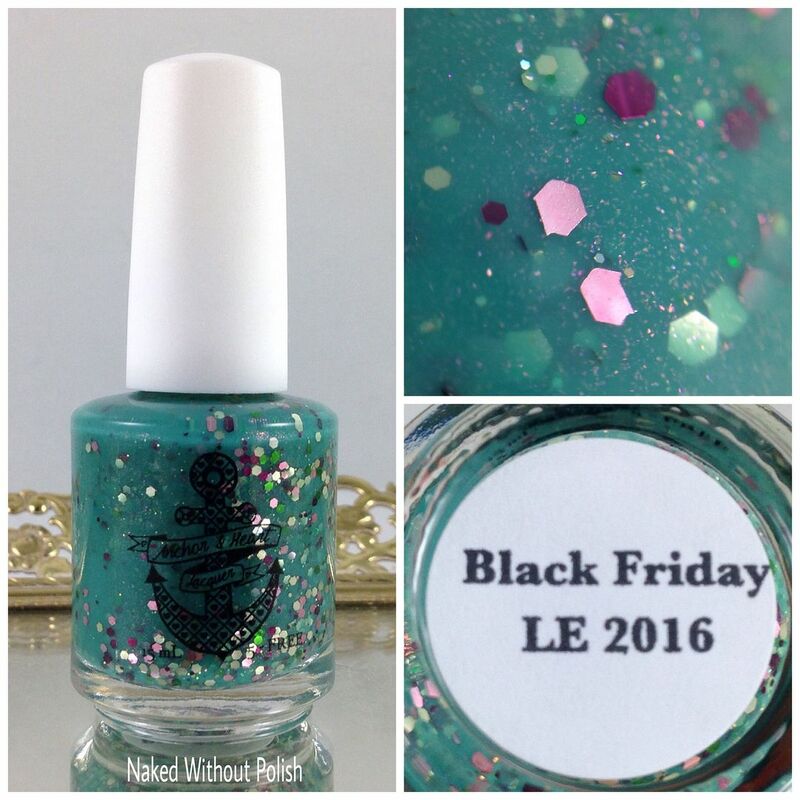 Black Friday LE 2016 is described as "a muted blue-green crelly with pink, olive green, and gold metallic glitter, and a lovely soft pink shimmer throughout". 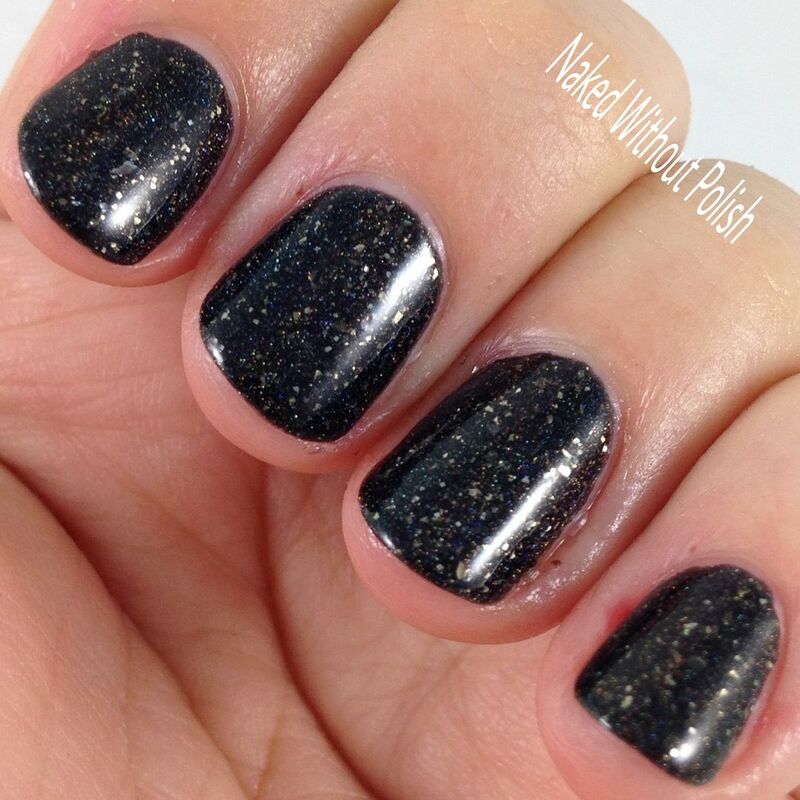 Shown is two coats of Black Friday LE 2016 with top coat. Black Friday LE 2016 is such a fun combination of colors. 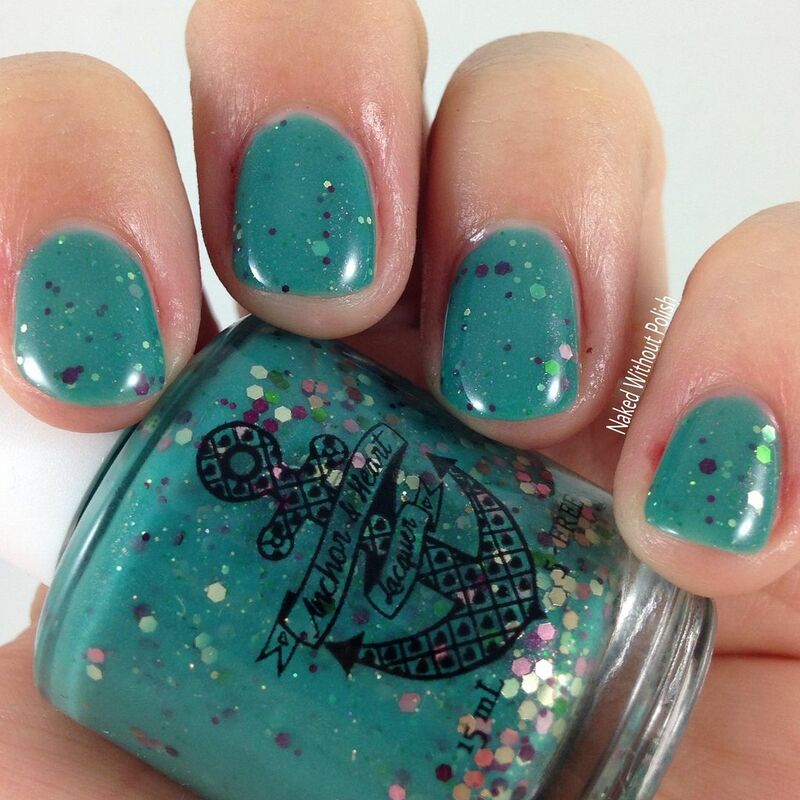 The base is a great shade of teal, and using the contrasting pink shimmer was such a great idea. It only took two coats to reach full opacity. I love how sporadic the glitter ends up being. 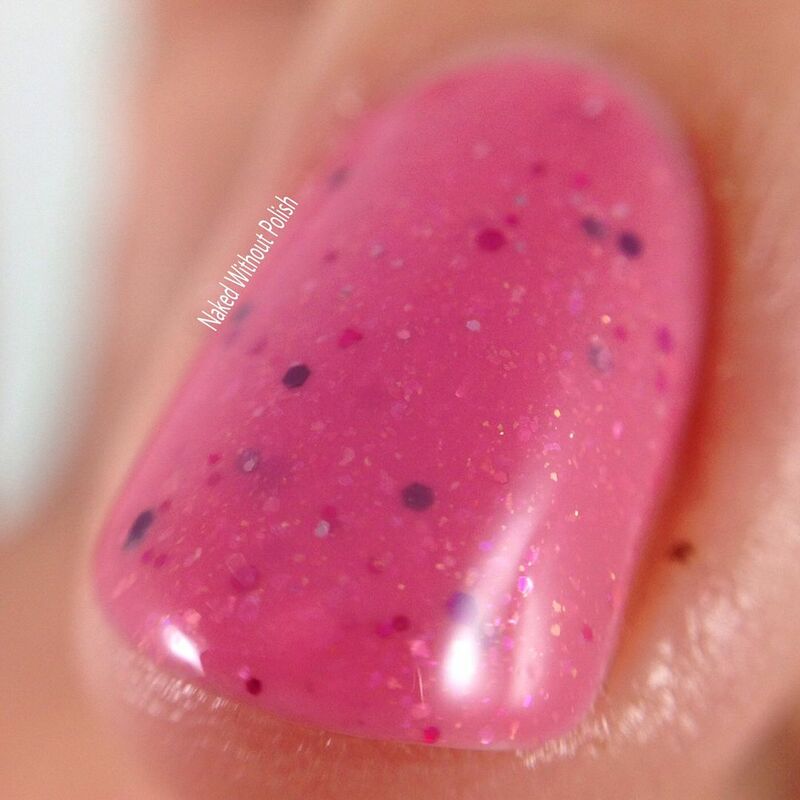 She has such a gentle hand when adding just the right amount of glitter to the polish. It is just enough to really accent the color without overwhelming it. 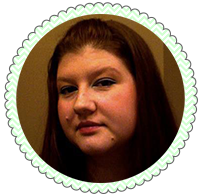 Black Friday LE 2016 was only available as a gift with purchase over her Black Friday sale. It isn't available to purchase. For those of you who missed out, make sure you don't miss out on any more of these! Trust me, you'll regret it! What do you think of the December 2016 Trio? Will you be purchasing this set? Not sure? Try your chance at winning a set for yourself...keep reading to find out how! 4. Giveaway will run from 12 am EST on 12/8/2016 through 11:59 pm EST on 12/8/2016. 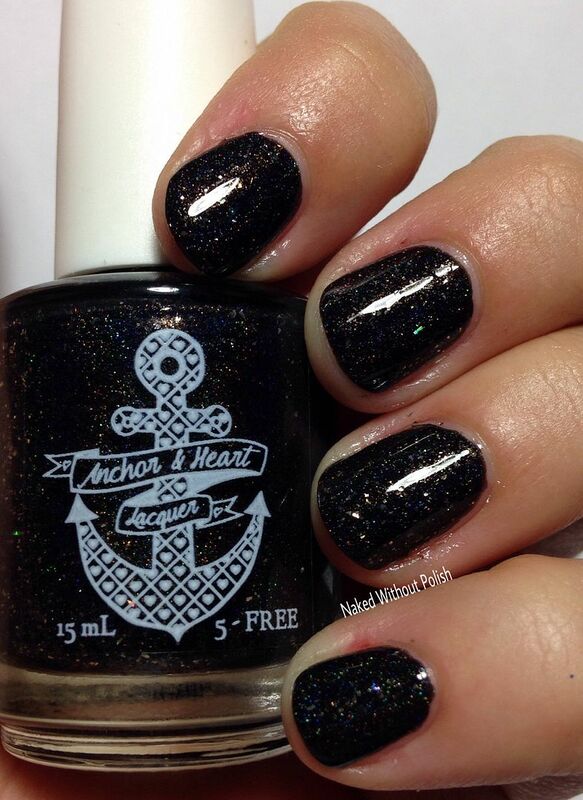 1 whole set of the December 2016 Trio from Anchor & Heart Lacquer.